For the Europan2 in 1990 for Florence, Mauro Galantino proposed an urban park made by compact housing within commercial space and a porch-walking-path. The winning project was resolving the area whit an interesting infrastructure system and the housing/commercial typology. (A system re-proposed by Galantino in many of his national and international projects). 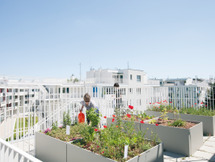 In fact, the housing proposal offers an active relation between the building and the urban life and the relation between the building, private garden, and the roof workspaces. The porch also was thought to be used by everyone on longitudinal sense and just by children on the transversal way.